Sidewalk and Brick Building. © Copyright 2019 G Dan Mitchell – all rights reserved. 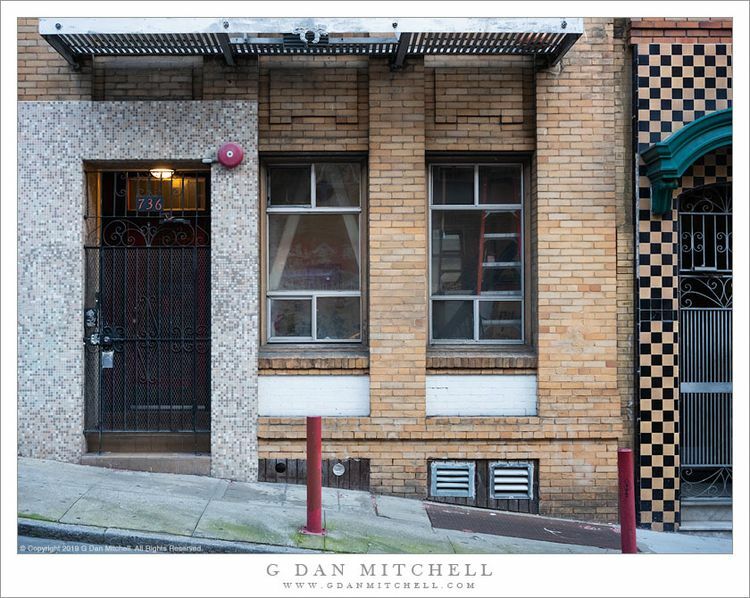 The front of a brick building on a steep San Francisco street. The tilt of the sidewalk may just give away the location, at least if you happen to already know that I frequently photograph urban subjects while walking around San Francisco. As is often the case, I now don’t recall precisely where I photographed this little vignette, though there is a very good chance that it was in or not far from the Chinatown district of The City. Without knowing exactly why — though I have a few ideas — I’m always attracted to little architectural scenes like this one. My best guess is that it is some combination of color, composition, texture, and light. Most of the color in this scene is not very intense, but the red pole and the greenish winter moss caught my attention. The scene is filled with rectangles, from the smaller size of tile and bricks to the larger shapes formed by the windows, doors, and sections of wall.